Steamboat Springs is located in the northwest corner of Colorado with easy driving access from east and west on US Highway 40. 157 miles Northwest of Denver, an easy 3 hour drive. Take I 70 west through the Eisenhower Tunnel to Silverthorn, Exit 205 (67 miles). Take CO 9 North to Kremling (37 miles), then West on US 40 to Steamboat Springs (53 miles). 230 miles Northwest of Colorado Springs. Take I 25 north to C 470 (53 miles) then C 470 west to I 70 west (15 miles). Take I 70 west through the Eisenhower Tunnel to Silverthorn exit 205 (67 miles). 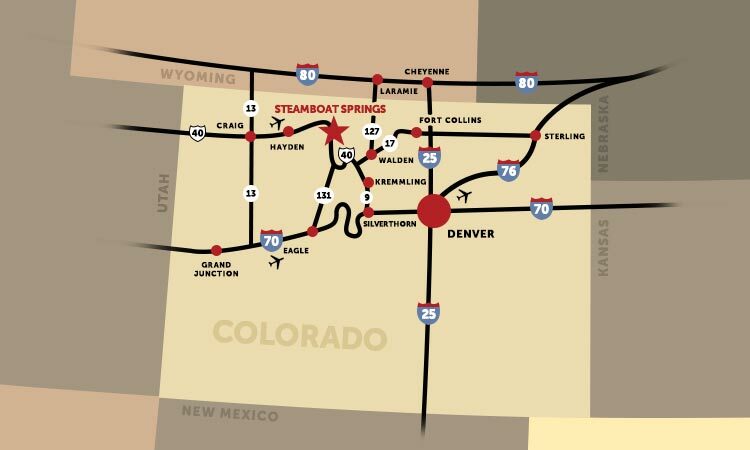 Take CO 9 North to Kremling (37 miles), then West on US 40 to Steamboat Springs (53 miles). Take CO 14 West, through Pouder Canyon, over Cameron Pass until Walden, CO. Take CO 14 (toward Steamboat springs) until US 40, and turn right (West) over Muddy and Rabbit Ears Passes to Steamboat Springs. Take I 70 West through Glenwood Springs and Eagle to Exit 157(117 miles). Take CO 131 North (75 miles) to US 40. Turn left on US 40 to Steamboat Springs (4 miles). Take I 70 West to Exit 157(117 miles). Take CO 131 North (75 miles) to US 40. Turn left on US 40 to Steamboat Springs (4 miles).